By LONG-TIME NCRS member Noland Adams (NCRS #4). 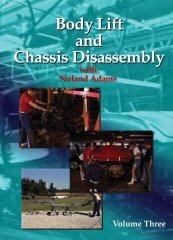 He covers body lift, body dollies, chassis disassembly, and frame detailing in this third video in the series. You receive a free copy of Noland Adams' Body Lift Workbook when ordering this video. A $12.95 value absolutely free!